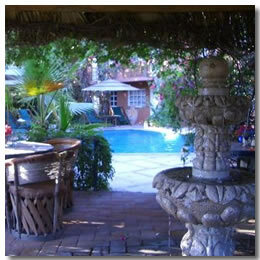 The Bungalows Hotel is one of our favorite hotels that we have stayed in during a vacation to Cabo San Lucas. One of the most fantastic things about this hotel are the staff. Eric, Etselle and Junior are the friendliest people you will ever meet. And this rubs off on the rest of the staff as well. 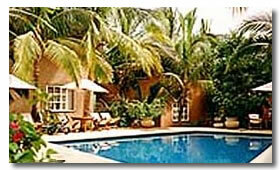 Compared to most of the other hotels in Cabo San Lucas the Bungalows Hotel is quite small. It only has 16 rooms, but this helps them get a more personal feel with the people staying there. You will find you're on first name terms with the staff very quickly. They do things that just doesn't happen at any other hotel. If they're having a quiet period, and you need directions somewhere into town Eric will quite happily walk you to where you need to go. Even if it's to the beach. It's just incredible. The rooms are a very good size, and are filled with charm. We was fortunate enough to get the honeymoon suite, but unfortunately we only stayed at this hotel for 2 nights. The hotel is 3 blocks from downtown Cabo but the honeymoon suite still gives you a partial view of the ocean. The kitchen area was large, and the deck had a beautiful fountain. This is a bed and breakfast hotel so the only meal you get is your breakfast, and it's good. Lots of people rave about the breakfasts here. I suppose because they only have to do one meal they pay a bit more attention towards it. With the Bungalows Hotel not being very big the pool is always very peaceful. It wasn't like a big resort hotel where you have crowds of tourists around it. The afternoon dip was an enjoyable experience. If you don't like walking up hills then your walks into town won't be very enjoyable. 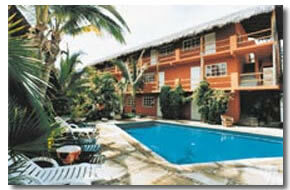 But apart from that a stay at the Bungalows Hotel is highly recommended.